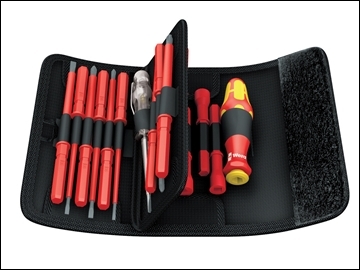 The Wera Kompakt VDE Screwdriver Set comes with 18 nterchangeable blades, including slotted, Phillips, Pozidriv, PlusMinus/MCB and switch cabinet blades. The screwdriver tip is made from powerbit grade steel for unbeatable strength. The VDE handles features a blade auto-lock system and the Kraftform design handle uniquely fits the hands contours during use. Individually tested for dielectric strength under a 10,000V load, to guarantee safe working at 1,000V. Drop tested at extreme temperatures to ensure insulation won't fail in tough jobsite conditions. Supplied in a rugged belt pouch. 1 x 817 VDE Kraftform Blade-Holding Handle (102mm). 4 x 154m KK 60 i Slotted Blades: 2.5. 3.5, 4, 5.5mm. 2 x 154mm KK 62 i Phillips Blades: PH1, PH2. 2 x 154mm KK 62 i PH/S Baldes: PHS1, PHS2 (minus blades for combination screws). 2 x 154mm KK 65 i Povidriv Blades: PZ1, PZ2. 2 x 154mm KK 65 i PZ/S Blades: PZS1, PZS2 (minus blades for combination screws). 4 x 89mm Switchboard Cabinet Blades: Square: 6.3, 8.1mm, Triangular and Round. 1 x 70mm Voltage Tester (0.5 x 3.0).